Living in Indiana, means not knowing what kind of weather Halloween will bring. Some years we have Indian Summers (or so the weather man calls them?) -while some Halloween’s bring snow. To avoid the risk of my children getting cold while trick or treating door to door… I always try to make sure their costumes are warm enough to block crisp air from reaching their skin. Last Halloween, my daughter was a cat. I made her the Fingerless Kitty Cat Mittens. This year she will be a FOX! 😀 So far I have made the Fox Tail, and the Fox hat. It’s only fitting that I make her new fingerless gloves to match this years costume. 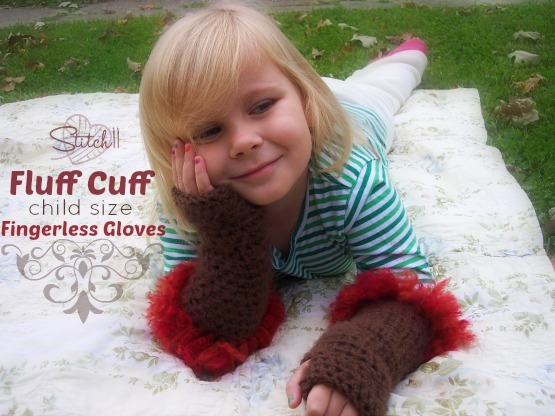 And like most of what I make, here is the free pattern for these adorable Fluff Cuff – Child Size Fingerless Gloves! Medium weight yarn – I used “Brown” I Love This Yarn for the gloves. Medium weight “Terra Cotta” I Love This Yarn. (It’s a rusty orange) and “Cranberry” I Love This Yarn. (It’s a pretty rosey color) for the fluff. 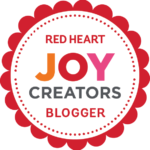 Red Heart yarns would also work perfectly for this pattern. You will be working in continuous rounds. You may wish to use a stitch marker. I like to use my starting yarn end to mark my spot at the start of each round. Round 1: FSC 18. Join to first FSC. Round 5: SC into next stitch. CH 3. Skip 3 stitches. SC into next stitch. HDC into next 13 stitches. Round 6: HDC into next stitch. 3 HDC into CH space. HDC into next 14 stitches. Round 7-19: HDC into the next 18 stitches. Round 20: SC into next stitch. Slip stitch into next stitch. CH 1. SC into same stitch and SC into next 17 stitches. Join to first SC. Cut pieces of yarn about 4 inches long. You will need to attach 3 strands at a time over the SC stitches of Round 20. To attach them, fold 3 strands in half. Insert your hook around a SC stitch. Put the hook through the fold of the yarn strands. Pull through stitch creating a loop. Wrap yarn ends over the hook, and pull through the loop you just made. Tug on yarn strands. Once you have attached yarn the entire way around, trim the yarn to be about 1 inch long. Brush the yarn with the pet brush until it’s fluffy. Lightly brush the entire glove to make a slight fluffy look to the stitches.